Lex's Landing hand ties all the Rogue River leaders and Spinners we sell here. These are the best you will find to fish here on the lower Rogue. We also make all the spreaders and pour our own lead. Our office is open at 6:00 am PST to provide you with "fish ice", bait, tackle, sodas, beer, wine, coffee, and snacks. Lisa Prestininzi and guest show off their great catch! Please contact us to inquire about availablity and pricing. 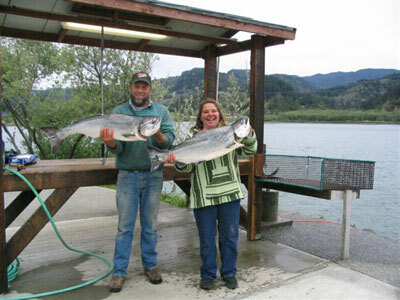 We are looking forward to visiting with you and making your stay in Gold Beach pleasant and carefree.